TES Eletronic Solutions develops hardware and software systems and sub-systems, with profound expertise in embedded systems, graphics and HMIs for a series of industries, specially the automotive area with driver assistant systems like 3D Surround View. TES 3D Surround View is a demonstration of driver assistance systems with vehicle cameras. Its implementation is GPU optimized with OpenGL ES. The software is highly portable as well as customizable and supports any kind of cameras. When the installation ends, power-cycle the board and wait until you see TES 3D Surround View. The TES 3D Surround View has a preset resolution of 1280x720@60 Hz (720p). 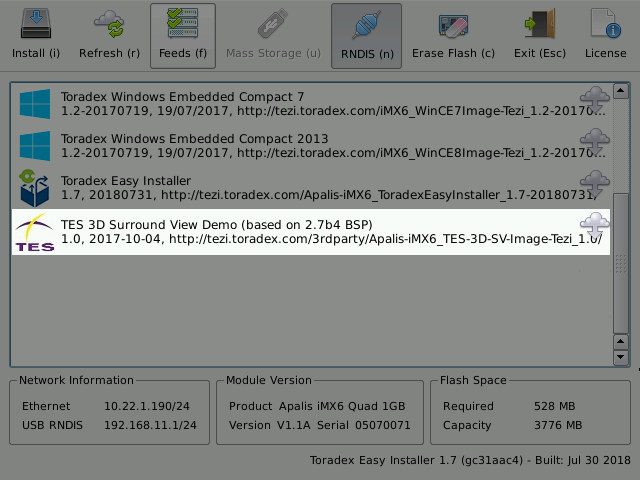 To change this parameter according to the supported resolution of your display, it is necessary to have proper access to your target module serial console (please refer to Apalis iMX6 Getting Started Guide). To control the camera and observe the vehicle surroundings, please connect a USB Keyboard. To access one of the fixed views, press number keys from 0 to 9, as the sidebar from the Graphical User Interface shows. For more information about TES 3D Surround View head over to the TES documentation and TES 3D Surround View Product Brief. TES offers licenses for evaluation, prototyping, product development and production. In order to get started, please contact TES and get your evaluation kit.